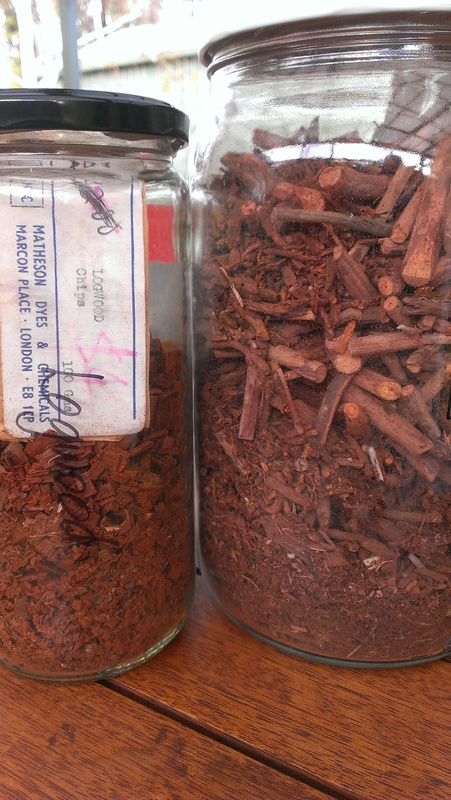 Three cheers for dried madder root! You may remember that I acquired some through the Guild. I set out by pouring boiling water over it twice, and draining off the resulting liquid. This is a strategy which is usually described as a good idea in order to help separate some of the brown and yellow pigments in the root from those which might produce red. 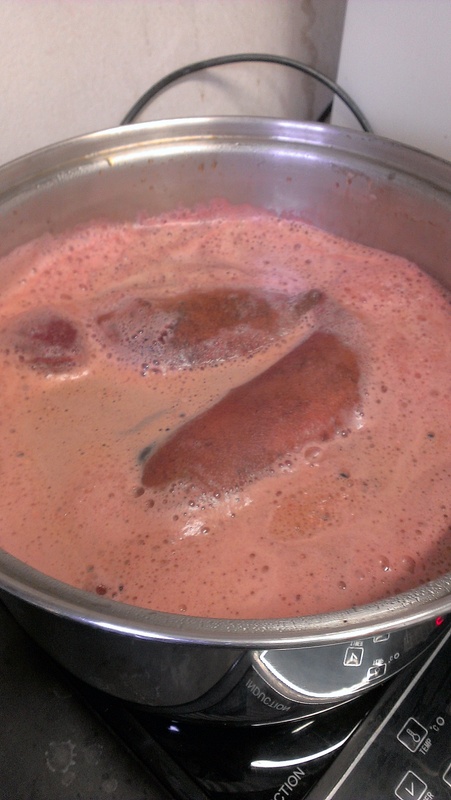 The resulting liquid was very dark brown. I saved it for later experimentation. I’ll get back to that! 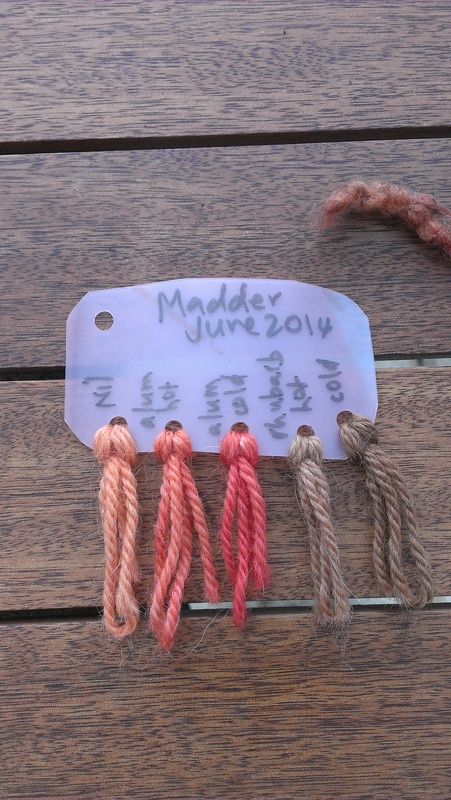 Every long term reader of this blog knows I can organise orange dye in a heartbeat, so I was hoping for red from madder. When seen at the workshop I ran at the Guild, it was looking rather orange. However, time is needed. And gentle heat. This pot produced some light reds at the Guild. Once again, the cold processed alum, long steeped sample gave the most intense colour. Rhubarb (the two samples on the right hand side), not so much. I didn’t think it was done, however, so I took the whole dyebath home. Happily, no mishaps en route. Since then, I’ve been happily trying to exhaust this madder. I have overdyed grey corriedale. 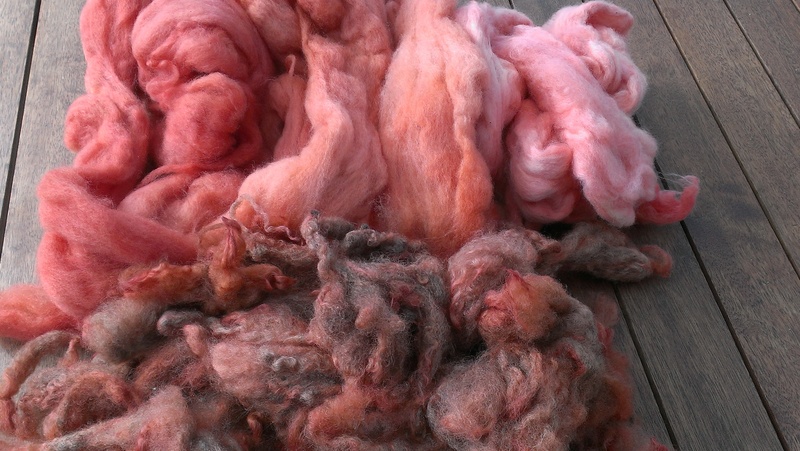 The fleece took up the dye differently in different parts of the locks (the weathered paler tips most of all). When I ran a dye bath with the rinse water… to my surprise it gave a strong red, stronger than the exhaust dyebath by far. Here it is on the left, with the original dye bath on the right for comparison. I also dyed quite a bit of merino roving I happened to have put by, achieving three different shades. And some more grey corriedale… not bad going from madder root that might have been in those jars for decades. that’s very interesting. 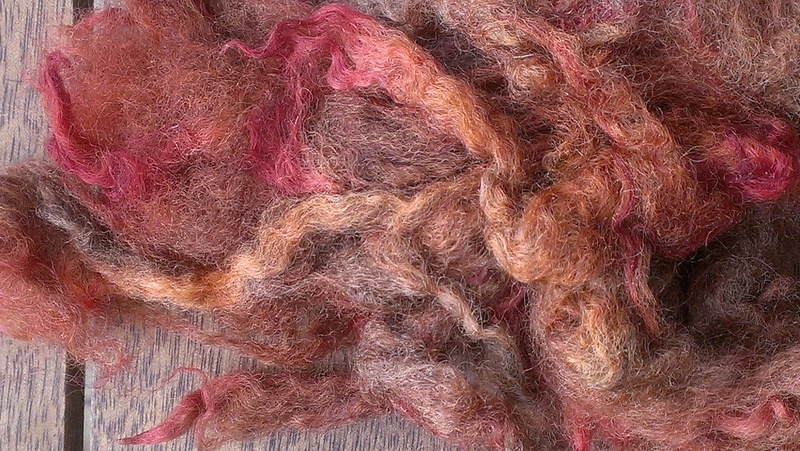 I just did a course with Michel Garcia on dyeing with plants, and for wool and madder we didn’t use any metallic mordant, but tannic acid from gall nut extract, and citric acid. got a most beautiful red with a slight rust tinge. I have a box of his plant dyeing products just arrived from the south of France. 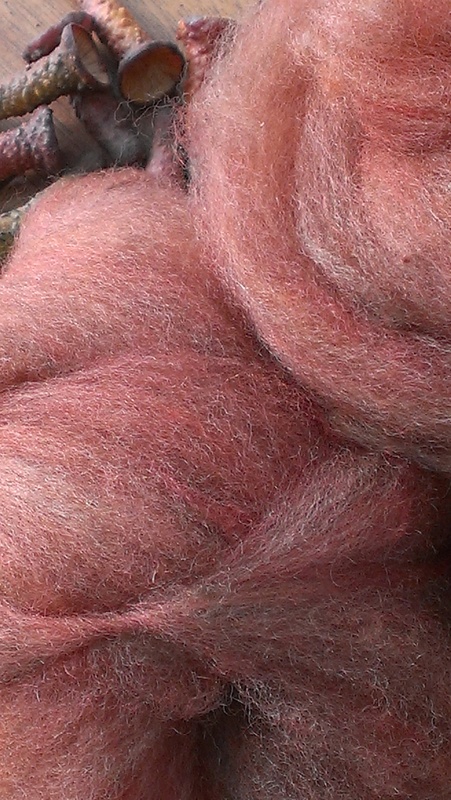 I have posted on the course in my blog, but not much detail, but there is a photo of the madder dyed wool. when I get time to try out what I learnt I’ll be posting more. I’m not sure how it relates to your very interesting and surprising results. we didn’t do your initial separation, but the product is already in a powder form. looks like you have some lovely yarn colours there! All very pretty. The beauty is that from one dye and ‘one pot’ you achieved so many harmonious colours. It’s one of the delights of plant dyeing, I think. Thanks! Thanks for the post I might just get my madder out again. I always seem to have the dyebath boil the second I take my eye off it. Am I correct in understanding that the first rinse you referred to is what came off from pouring on the boiling water? Yes, exactly, I poured hot water over the root, let it sit for a few minutes, then poured it off into a jar. Good luck with temperature control. It’s clearly crucial with madder. I don’t step away from it unless I have the temp stable! Thanks, Leena! 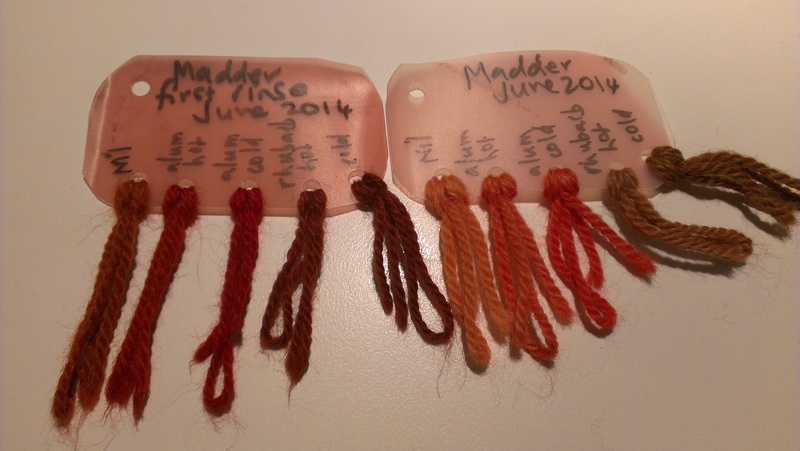 I have read your posts on dyeing with madder at low temperatures, and your results are brilliant. It is midwinter here… but I wonder if I could try that in ambient summer temperatures here. A happy thought! That makes total sense… I did have a gift of a crock pot years ago but I hadn’t met madder then, and gave it to someone who wanted to use it for… dinners. I’ll have my eyes open now though! Thanks for the tip. I’m growing madder and hope to have years of messing about with it ahead. I’m just in awe! Your dyeing skills are impressive..
What beautiful hues you got in that fiber!